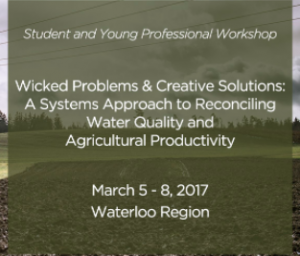 From March 5-8 2016, EDGES member Sameer Shah recently attended the Canadian Water Network’s workshop on “Wicked Problems and Creative Solutions: A Systems Approach to Reconciling Water Quality and Agricultural Productivity”. The workshop was hosted in Waterloo on behalf of Professors Nandita Basu and Merrin Macrae (University of Waterloo). Participants, from all across Canada, were introduced to the foundations of nutrient chemistry and biology, strategies for improvement, and barriers to change. A central insight from the workshop involved re-orienting nutrient management as an effort confined to reducing fertilizer inputs at the farm-scale towards a more holistic systems-wide perspective that recognized barriers—social, environmental, and economic systems at different levels—affect the effectiveness of nutrient management regulations and programs.